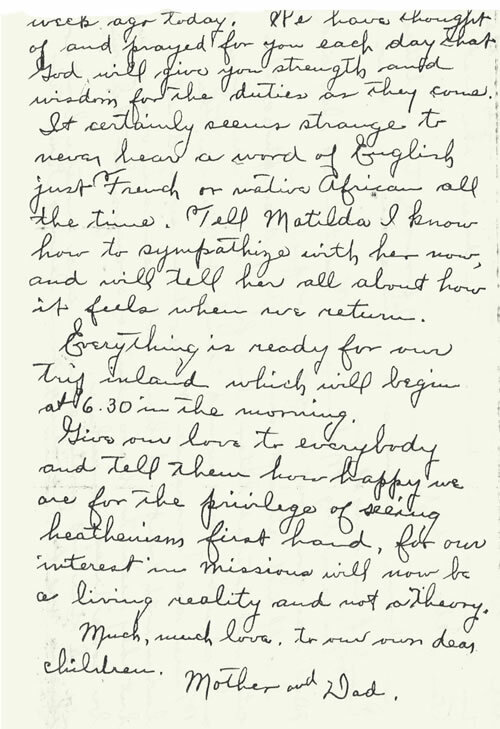 Editor’s note: This letter was written by Mrs. Forrest to Kelly and Alice Barnes, March 3, 1930, while she and Dr. Forrest were in Africa. 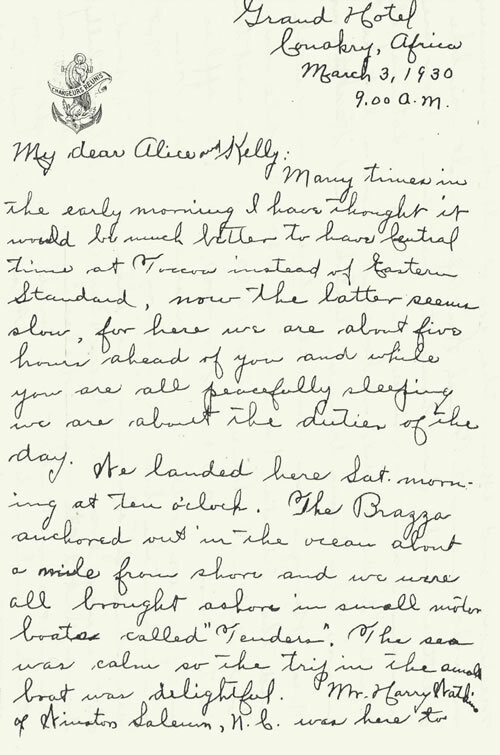 Many times in the early morning, I have thought it would be much better to have Central time at Toccoa instead of Eastern Standard, now the latter seems slow, for here we are about five hours ahead of you and while you are all peacefully sleeping we are about the duties of the day. We landed here Saturday morning at ten o’clock. The Brazza anchored out in the ocean about a mile from shore and we were all brought ashore in small motorboats called “Tenders.” The sea was calm so the trip in the small boat was delightful. Mr. Harry Watkins of Winston Salem, NC was here to meet us and express the joy of all the missionaries in welcoming us to French West Africa. It was like a little breath of home to meet him. You are wondering I am sure, since we landed on Saturday, why Monday finds us still at Conakry? There is but one answer, the trains between Conakry and Kaukau our Mission Headquarters ran only three times a week and the Saturday train left at 6:30 a.m. while our boat did not arrive until 10:30 a.m., the next train is tomorrow at 6:30 a.m. However Rom. 8:28 applies in Africa as well as in America, I had been very sick on the boat, all the way from Bordeaux. Not sea sickness for the ocean was calm as a mill pond all the way, even the Biscay Bay behaved beautifully for us, but I ate a piece of cheese our first dinner on the boat and it upset me terribly and brought on an attack of asthma from which it seemed so hard to regain strength. I have gained more strength in the two days here than the whole ten days on the boat. Praise the Lord! 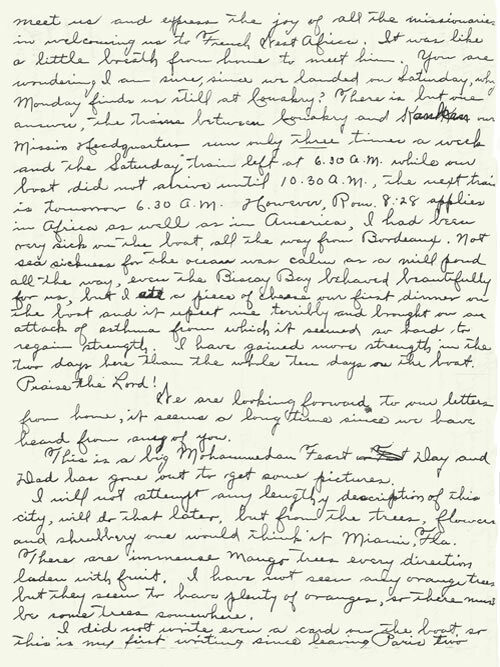 We are looking forward to our letters from home, it seems a long time since we have heard from any of you. This is a big Mohammedan Feast Day and Dad has gone out to get some pictures. I will not attempt any lengthy description of this city, will do that later, but from the trees, flowers and shrubbery one would think it Miami, Fla. There are immense Mango trees every direction laden with fruit. I have not seen any orange trees but they seem to have plenty of oranges, so there must be some trees somewhere. I did not write even a card on the boat so this is my first writing since leaving Paris two weeks ago today. We have thought of and prayed for you each day that God will give you strength and wisdom for the duties as they come. It certainly seems strange to never hear a word of English just French or native African all the time. Tell Matilda I know how to sympathize with her now, and will tell her all about how it feels when we return. Everything is ready for our trip inland which will begin at 6:30 in the morning. Give our love to everybody and tell them how happy we are for the privilege of seeing heathenism first hand, for our interest in missions will now be a living reality and not a theory. Much, much love to our dear children.